How’s this for irony. Agency marketers spend so much time growing other people’s business that marketing their own agency often takes a back seat. Recently, we had a chance to hear from Cat Howell, an expert at agency marketing who’s scaled her own Facebook advertising agency, Eight Loop Social, to a six-figure per month operation. 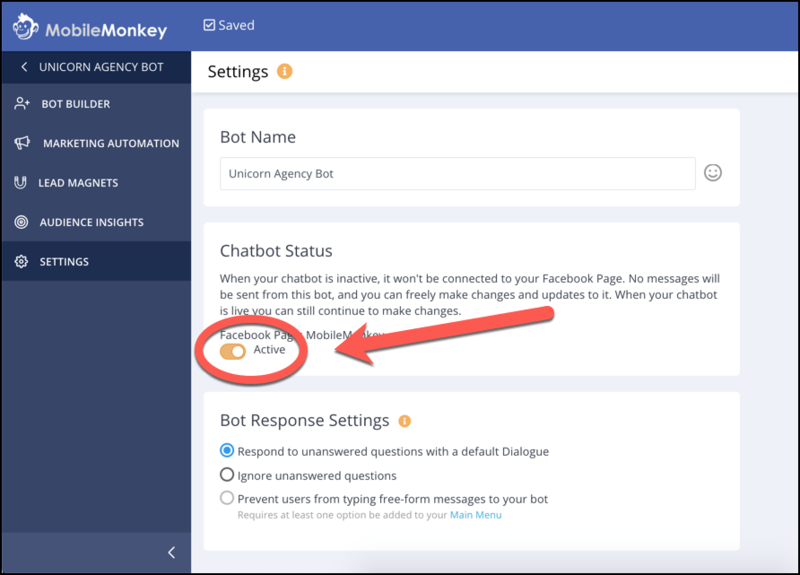 Cat shared her secrets to scaling using Facebook Messenger ads with lead qualifying bots during the MobileMonkey Facebook Ads Virtual Summit in January. 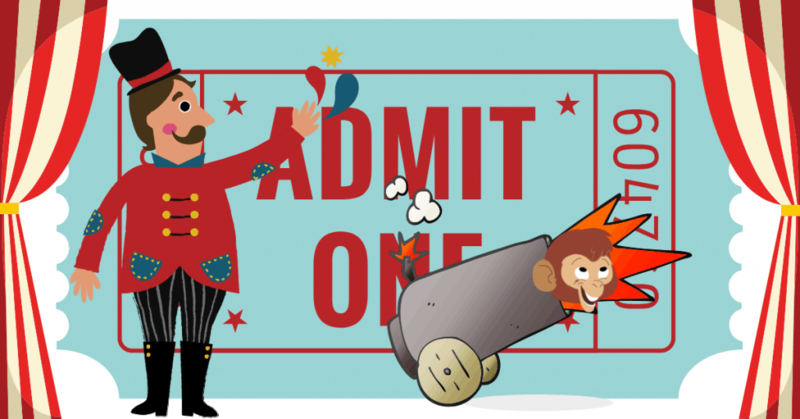 How to create a custom funnel for your agency. How to use messenger marketing to get more agency clients. The actual funnels and MobileMonkey bot template that Cat Howell created to grow her own business! Cat lays it out in a step-by-step way, and even provides the actual Facebook bot template that she uses. Just read on. There’s 7 more actionable Facebook marketing sessions coming to a screen near you next week at the next MobileMonkey marketing summit. Be sure to sign up to join us live for the free MobileMonkey Facebook Messenger Marketing Summit on March 27! First, who is this information for? In a word, agencies. A more nuanced definition is marketing agencies in the service sector. A solopreneur selling SEO services to chiropractors. A ten-person business that provides full-service PPC for SaaS accounting businesses. Someone who builds Messenger bots for small businesses that are already advertising on Facebook. What Cat came to realize, she said, is that a lot — a lot — of agencies have two big painful questions— 1) how can I generate clients, and 2) how can I convert those clients? What if you knew the solution to that problem? You’d probably be excited. At Cat Howell’s agency, Eight Loop Social, she has solved this problem. Ready for show and tell? $122 per action is good. Because we’re not talking about flimsy, unqualified, untargeted leads here. We’re talking about clients who will bring in potentially $2-5k. This achievement didn’t come without some serious hard work and years (yes, years) of testing, imposter syndrome feels, and some lean times. Each of these two points is essential, because unless you’re successfully converting those leads into customers, you’re wasting a lot of money. If you’re not already using Facebook advertising to generate leads you’re missing out on a big opportunity. Cat says she stumbled across this about two and a half years ago. At the time, there was no one that was really using direct funnels to generate business for their Facebook advertising agencies. Before she designed this solution for lead gen through Facebook Ads, Cat says she felt like such an imposter. That’s when she put her head down to try to figure out how to make ads work for agency lead generation. As she worked on it, these points occurred to her regarding Facebook advertising. She shared them for all of our benefit. There is a huge variety of Facebook funnels that can bring leads into an agency. Facebook offers the lowest CPM (cost per thousand impressions) out of any advertising platform. So, here’s the deal. 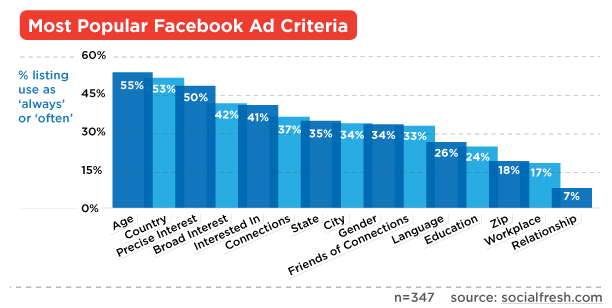 Facebook advertising is the starting point. Now, let’s take a look at the exact funnel Eight Loop Social uses to slash their cost per lead, increase their conversion rate, and successfully qualify a lead through to a paying customer. Marketing basics, yeah, but marketing essentials, especially if you’re going to start printing money by attracting high-paying clients like you want to do. Niche: High-ticket in-person business events. Think mastermind events and high-level networking meetings. So, once you have clarity on the essentials, it’s time to create your Facebook ad. And they used long-form direct response-style ad copy for the ad. Second, she wanted to identify with her target customer’s pain. Through a long and storied history of creating Facebook ads, nearly all of Cat’s best clients have come to Eight Loop Social as a result of long-form ad copy. Four basic phases. One beautiful conclusion. While the first phase in the funnel is the Facebook ad, the second phase in that funnel is the Facebook Messenger bot. The Messenger bot sequence is one of the most critical phases in the entire funnel. A lead cannot get to the call-booking phase (money!) unless she has successfully qualified herself in the bot. This funnel looks pretty sterile and boring, but the real magic of bots happens with the conversational flow. When you actually experience it in Messenger (and you can give Cat’s agency lead bot a spin here) it feels a lot more graceful and humanlike. You can use Facebook Messenger bots for all kinds of reasons. And one of the major reasons she uses them is to qualify superb quality leads. Cat is targeting high-potential leads only — people who are desperate, and can easily be closed and onboarded. Messenger bots are perfect for doing this. 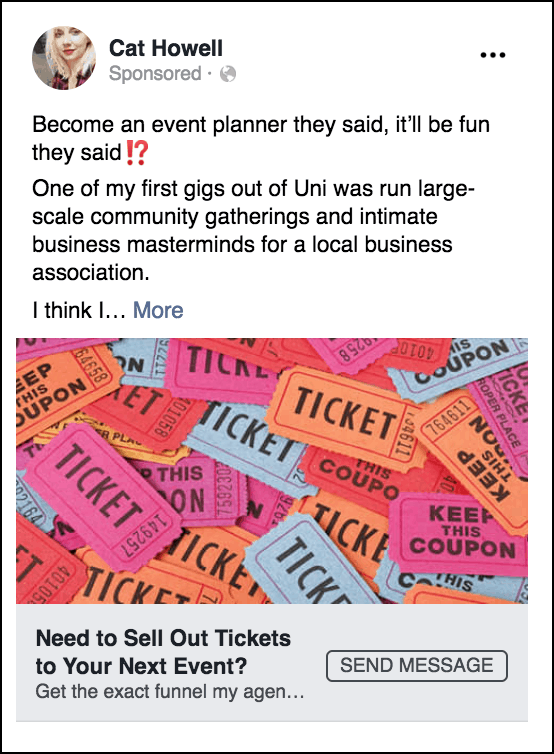 Have you run Facebook ads before? “We’ll work with anyone, regardless of the experience with Facebook ads, but we do want to have a sense of what we’re dealing with,” Cat said. How much revenue per month are you looking to generate? “This is the most important qualifying question. I want to make sure that my clients want to generate enough money to pay my agency’s management fee and plenty of ad spend,” Cat said. Can you clarify if you have a working funnel in place? “Once again, answering no to this question won’t disqualify the lead. 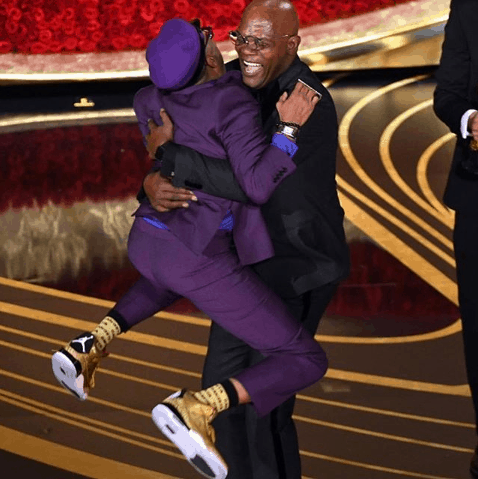 It’s simply important that our agency understand what kind of education or resources we will need to leverage on behalf of the client,” Cat said. Are you ready to invest? “We’ll accept the ‘YAAAASS’ leads and the ‘Depends’ leads, but we won’t waste our time on people who are unable invest at the moment,” she adds. All these squeaky-clean qualified leads pass the segmenting questions in the bot, and then Cat presents them with my calendar to schedule a time. Let the leads come pouring forth. Want to create this very same funnel? Cat already made it for you! To use it, follow these four steps. From the dashboard, expand the “More Chatbots (Advanced)” section and click the button to Create New Chatbot. Name your bot and click the option to start a bot from a template. 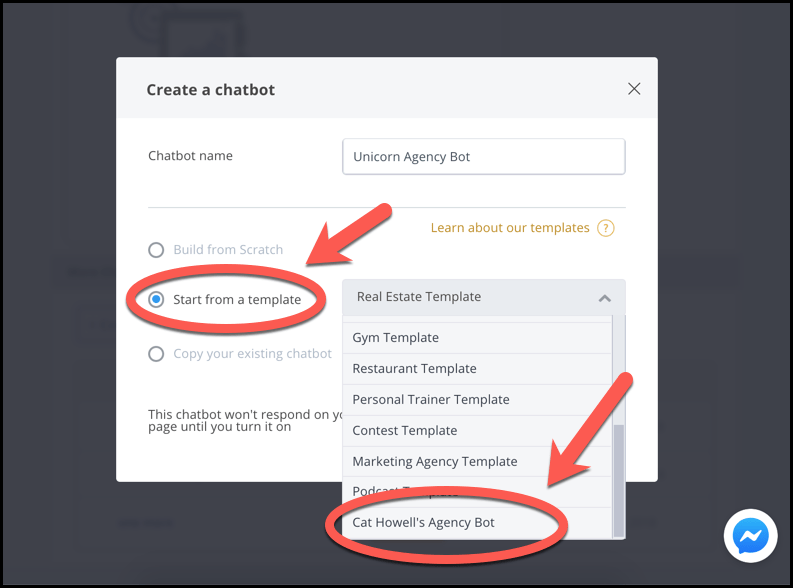 Pick “Cat Howell’s Agency Bot” from the drop-down of templates. From the bot builder, customize your bot welcome page with some text and any other content widgets you might want (you might use your logo, photo or a GIF). 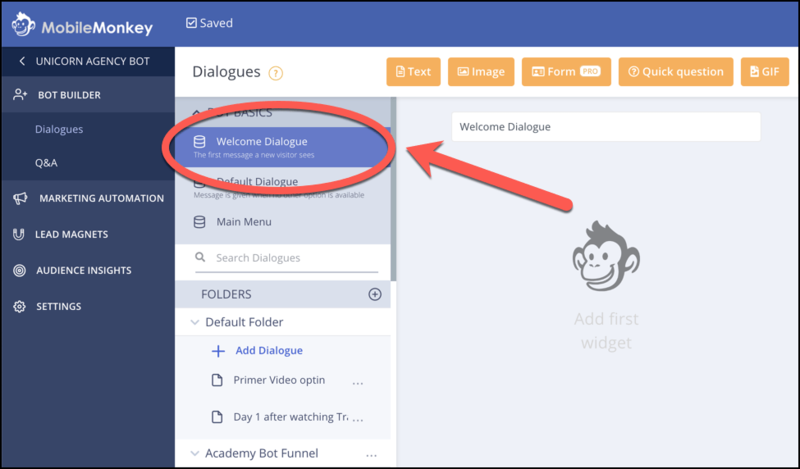 The welcome dialogue is the first thing a new user sees when they message your bot from your Facebook pages. Review the rest of the dialogues to see where you might personalize and customize other messages of the bot. From Settings, toggle the chatbot status to Active to turn on your bot. That’s it. You’re ready to roll. What about decent leads that don’t ultimately qualify? Pro tip: Cat’s insistent that only high-quality leads make it to her calendar. But what about all the others that fall off along the way? She cares about them, too. She was too busy to deal, and she wanted her business to make a buck. But she figured out that there’s a better way than just booting them into oblivion. You can monetize even leads who don’t qualify (yet). Hey, thank you so much. It looks like at this stage, we might not be quite a great fit, but I share regular resources, tips and training on how to make your ads successful, etc. And then she gets them into her Facebook Ad Hacks community (or adds them to a list or an audience). Maybe in six months they’ll be your perfect customer. She’s intent on nurturing all leads that come through her pipeline, because you never know what kind of awesome potential can come from them. Perhaps you have an audience that will eventually buy an online course, purchase a resource, or in time, become a conventional client. 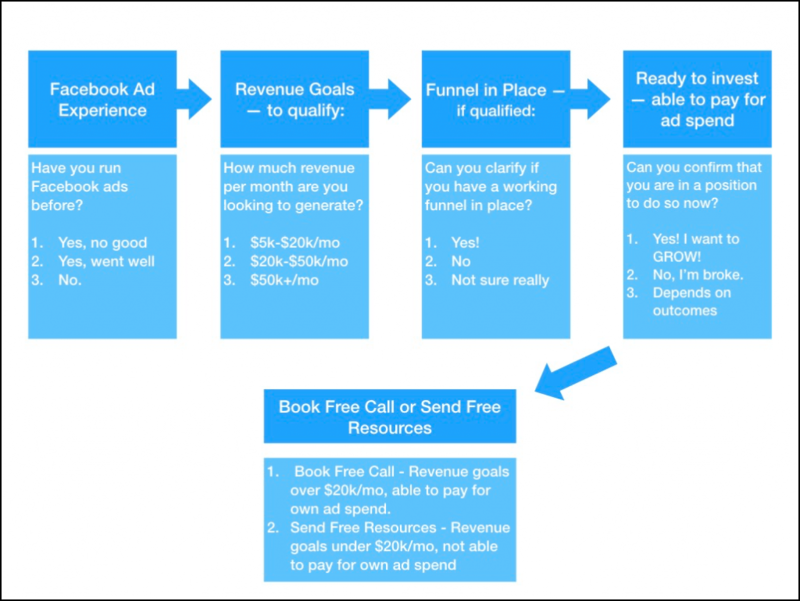 So, someone may follow this funnel template and tips, but you’re still getting crappy leads. It happens. Keep in mind that Facebook is a data machine. Machines don’t necessarily know a good lead from a bad lead. They have to be taught. Most of the time, marketers blindly use demographic data as the criteria creation. What if all those leads are crap? You might change the targeting or test different variations. But none of these fix the issue. Why? Because you’re optimizing for the same event. 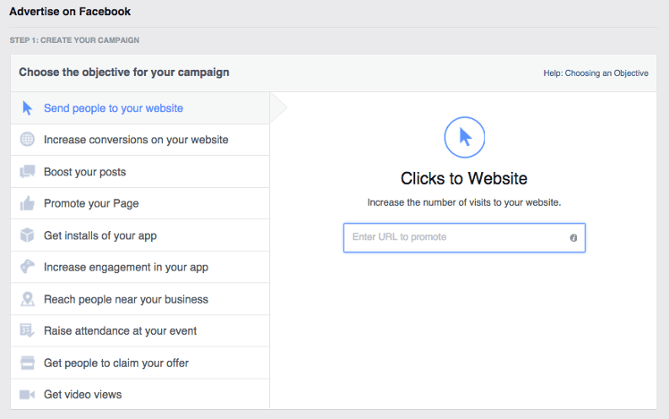 Facebook is finding targets predicated on the event you’re optimizing for. So what do you do to change the influx of worthless leads? You change the objective of your campaign. This takes a bit more work, but it’s the only real way that Cat says will keep Facebook from shoveling over all those bad leads. It starts by changing the event. Facebook is a data machine. Once you begin experimenting with different ads, creatives, and targeting, you’ll begin to sense the absolute power of this data and be able to leverage it in your advertising. 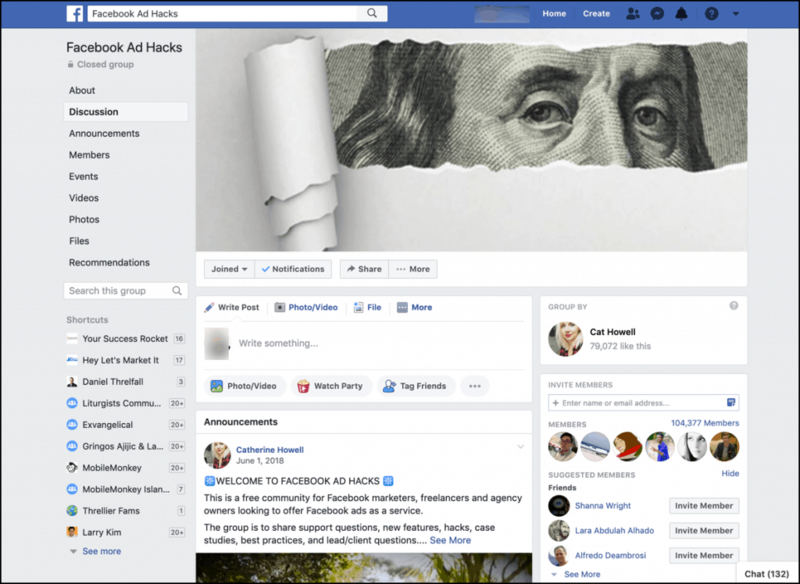 Here are Cat Howell’s three tips for making your Facebook ads better than ever. Dynamic creative. Dynamic creative is Facebook’s solution to find high-performing ad combinations and placements. You can select up to ten images (or videos) and five copy variations (body, text, title, description, and CTA). Dynamic creative is an outstanding way to learn what works best with your particular audience. Rapid fire testing. Whenever she’s testing a new funnel or working with a client who’s a newbie to Facebook advertising, she implements rapid fire testing. Testing things sequentially and quickly allows her to validate concepts and funnels. Before you waste a lot of money on a dud funnel, test as quickly as possible. She can typically perform this process with as little as $100 in as few as 3 days. The best way to employ rapid fire testing is to do so with dynamic creative. Retargeting. Anyone who makes it to the middle or bottom of your funnel without converting should be retargeted. They’ve shown promise, but they haven’t pulled the trigger. Retarget them using a different funnel, and again, test different concepts using dynamic creative. Most agencies aren’t interested in stagnant growth. 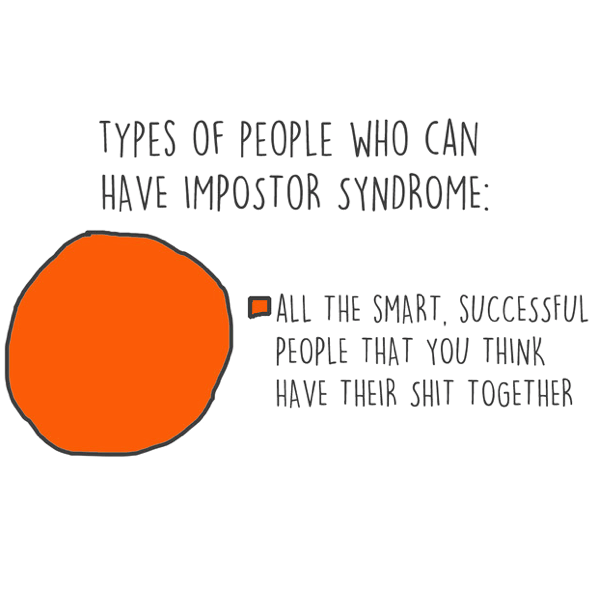 Then again, most agencies have a problem with finding ideal clients. By implementing Facebook ads with click-to-Messenger ad campaigns, and qualifying leads through a Messenger bot, finding these clients is far easier than ever before. 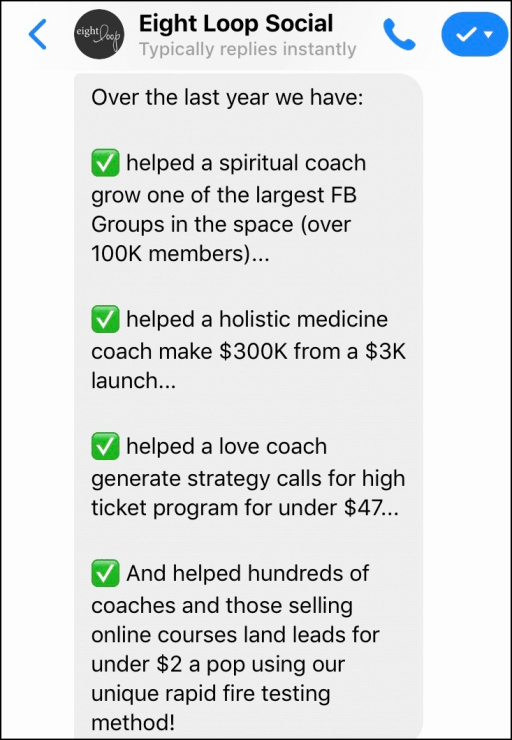 Cat Howell dropped crazy actionable Facebook Messenger marketing ad hacks in her MobileMonkey summit session. The next MobileMonkey virtual summit is Wed., March 27, and we’re anticipating another action-rich educational event teaching step-by-step playbooks to grow your business with Facebook Messenger and chat marketing – all actionable, all proven. View the live summit agenda here and reserve your free ticket. Limited spots are available and admission is FREE for a limited time. Join the +3,000 Facebook marketers who are fueling up to launch their clients and businesses into the next communication era. 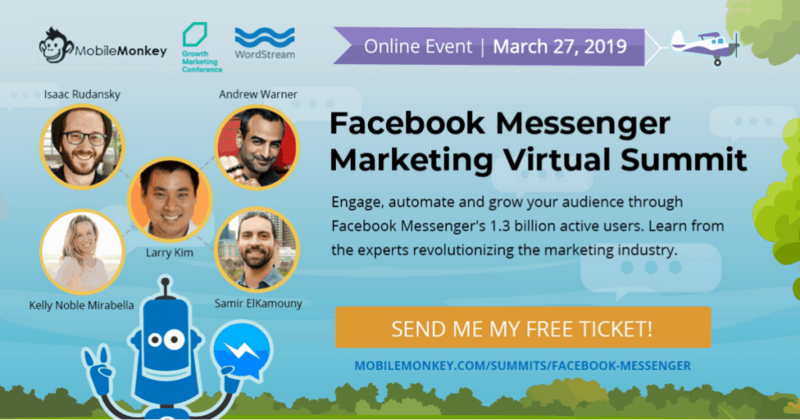 Get your free ticket for the MobileMonkey Facebook Messenger Marketing Virtual Summit here today. Get your free ticket to the Facebook Messenger Marketing Virtual Summit live on March 27 to learn the chat marketing strategies, tactics and tools for the most engaging new marketing channel. And love the Spike and Sam photo!